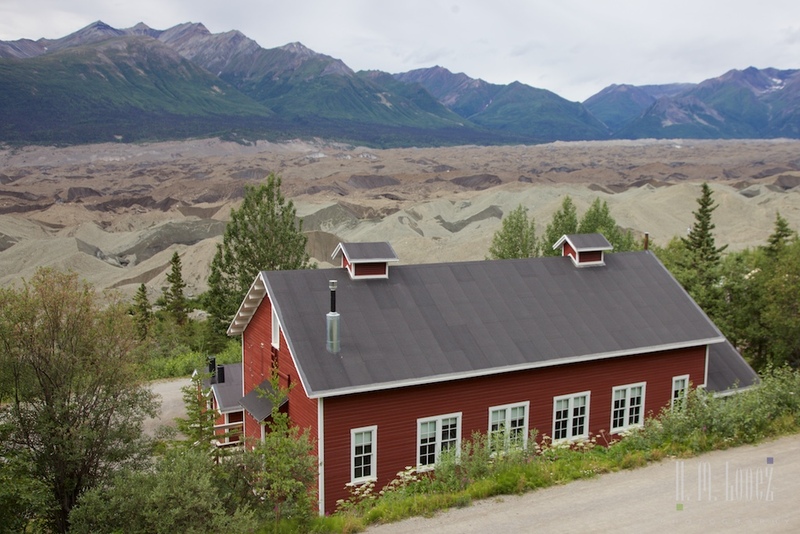 On Sunday, we took a tour up to the town of McCarthy in a 12-passenger van, on our way to the Kennecott Mines in Wrangell St. Elias National Park. To the surprise of a couple of passengers, Angel went with us. But she quickly settled in, and sometime into the ride, one passenger commented that they forgot she was there because she was so quiet. She is such a good girl! 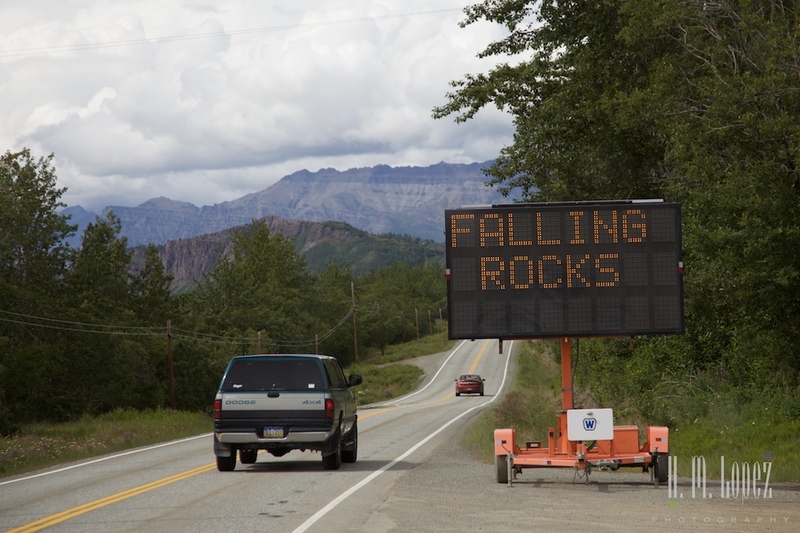 The road up to McCarthy and Kennecott has a very bad reputation. 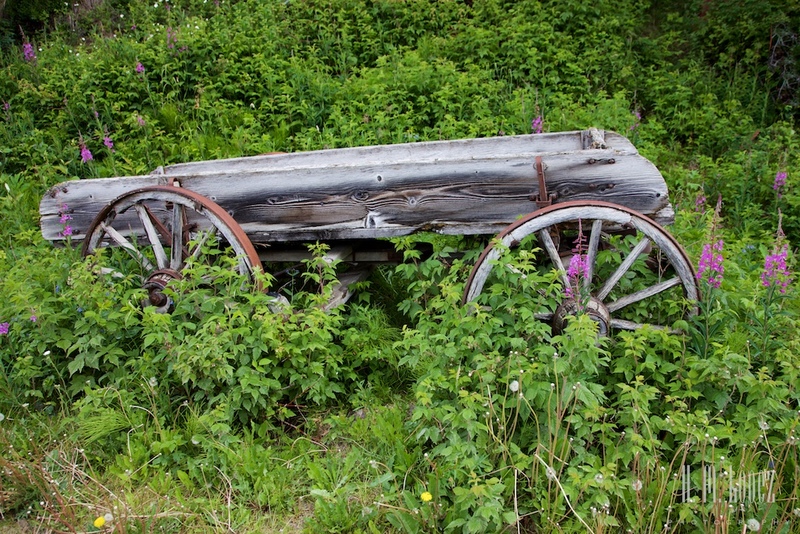 One person even told us that if we were to drive up there we would need two spare tires. 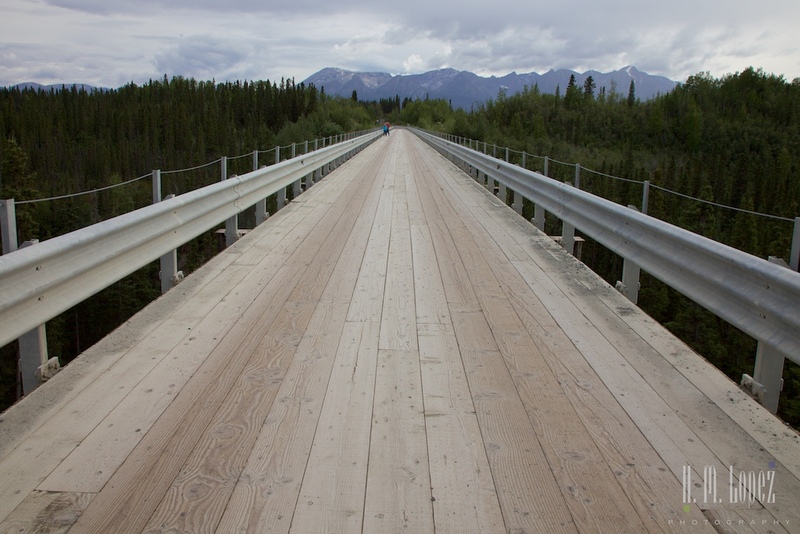 But the Wrangell St. Elias National Park ranger told Hector that the road was in the best shape it has ever been. Which did not matter much since our car was not working. The ride up on the van did confirm that the road was not as terrible as some people were saying. Yes, it is sixty miles of gravel road that gets progressively worse as you get nearer to McCarthy. And, yes there is a very long stretch of road that has a washboard. But our van made it through just fine. Well, sort of. The road is a 2-lane road, but just barely accommodates two cars in places. The driver of a rental class C was coming down the opposite lane at a pretty fast speed and never slowed down. He popped Kevin’s (our van driver) side mirror to the point that the glass shattered. After talking to the driver of the Class C, Kevin told us that his mirror flew off and hit him in the head. He was ok, but the damage was going to cost him. 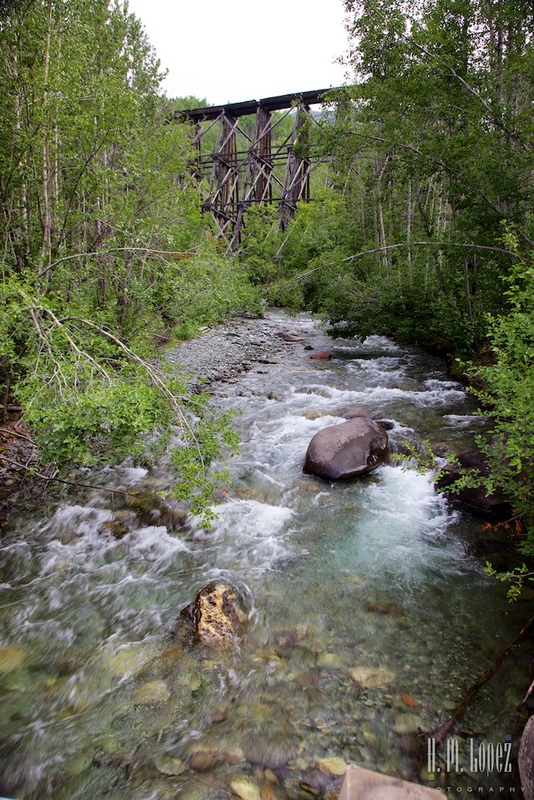 The van dropped us off at the footbridge that crosses a river to the “town” of McCarthy. 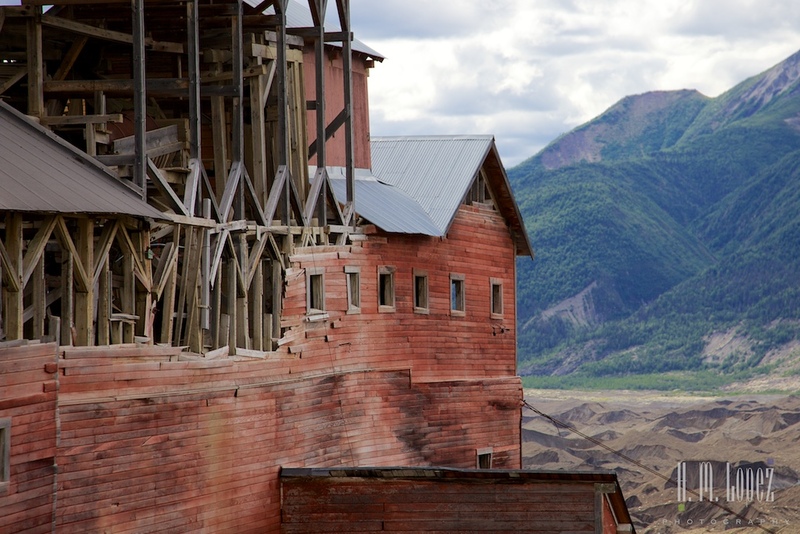 There you can catch a shuttle to the Kennecott Mines. The shuttle fee, $10 was included in our transportation fee. Those who drive up must park and take the shuttle. 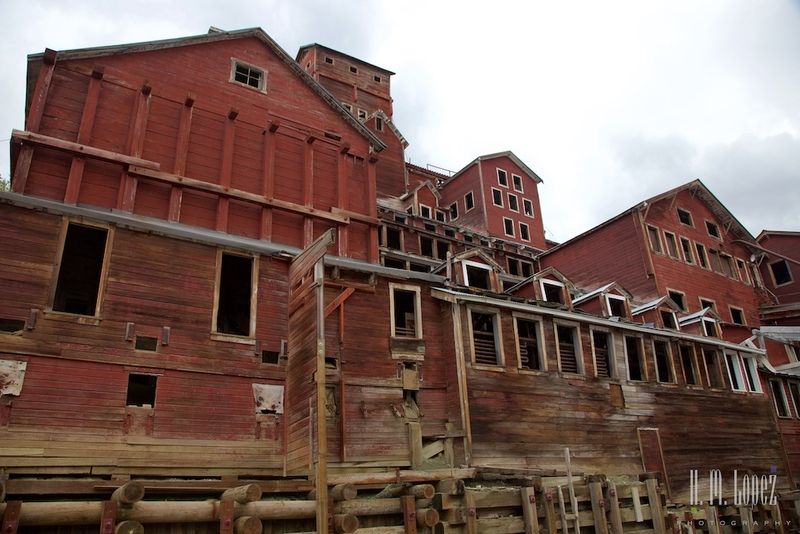 We skipped McCarthy and went directly to Kennecott. 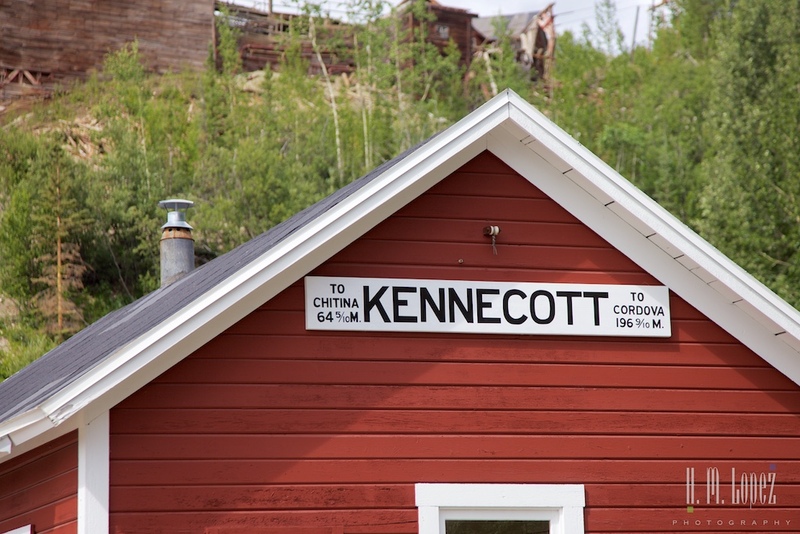 Although the town and the mines are named Kennecott, they were originally named after the valley and the glacier that used to extend all the way to the town, Kennicott. 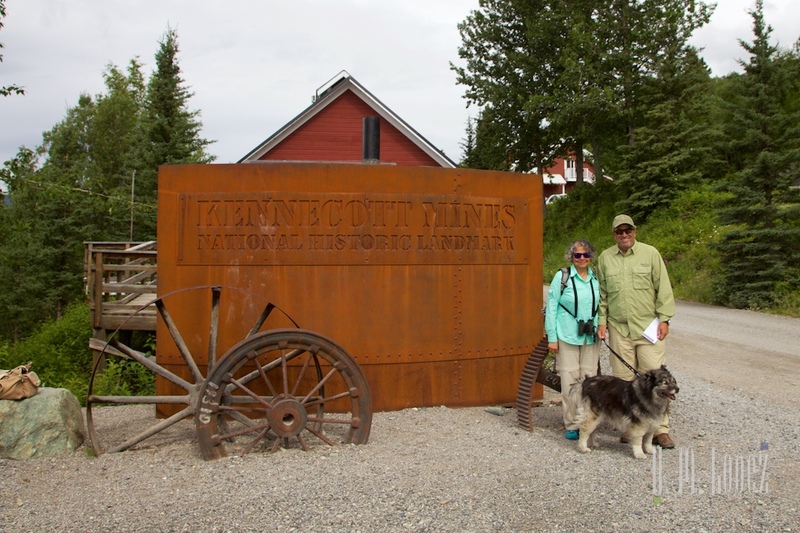 Robert Kennicott was a pioneer Alaska explorer. 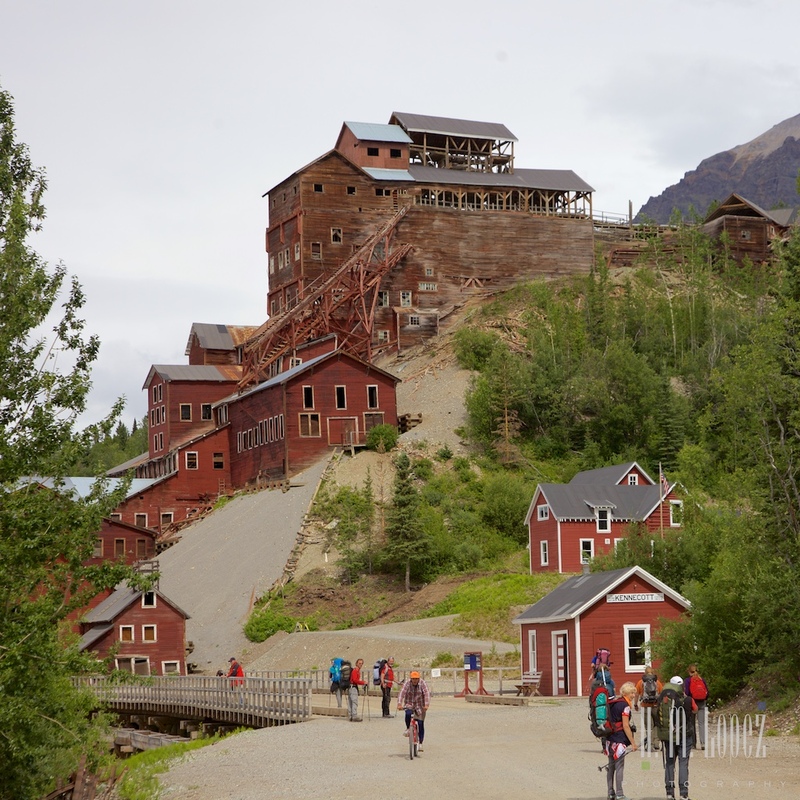 Somewhere along the way, there was a misspelling, and so the spelling of the name of the Kennecott Mining Company is different from that of the valley and glacier. 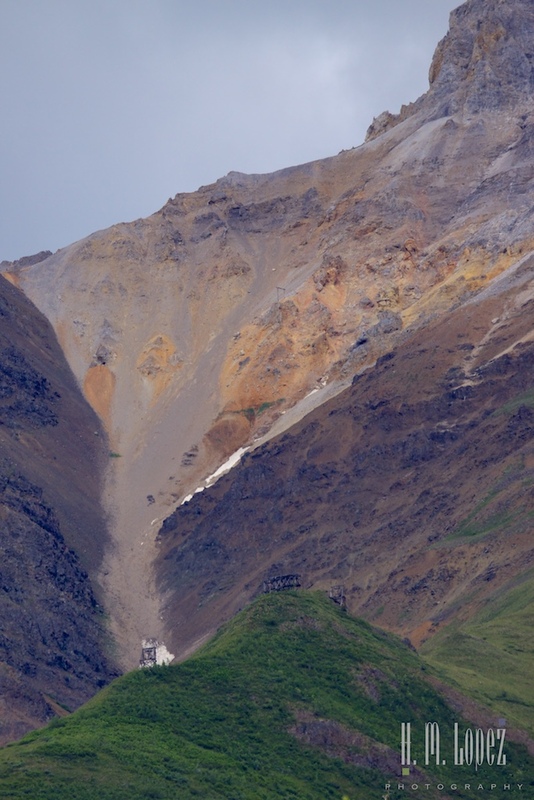 The Ahtna people collected native copper in the Kennicott Valley and made art, arrowheads and utensils from it. 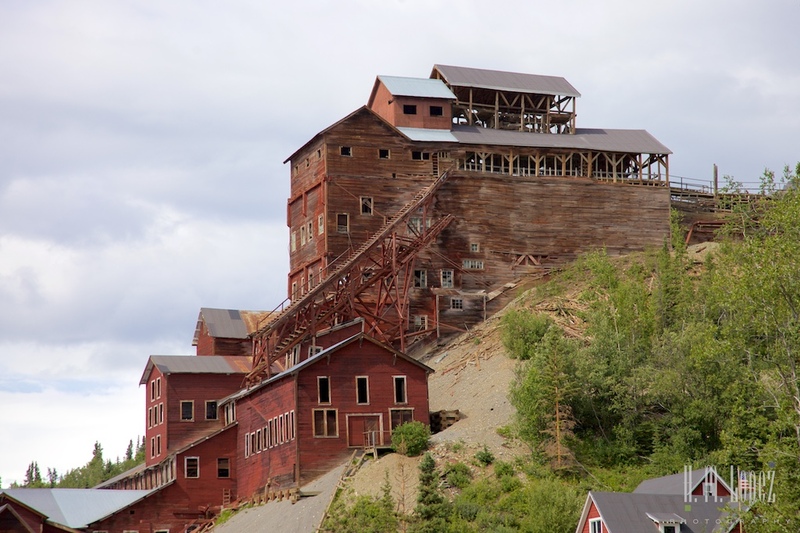 After noticing the copper being worn by the natives, prospectors Clarence Warner and “Tarantula” Jack Smith, discovered the high grade copper ore. That was how the mine came to be. 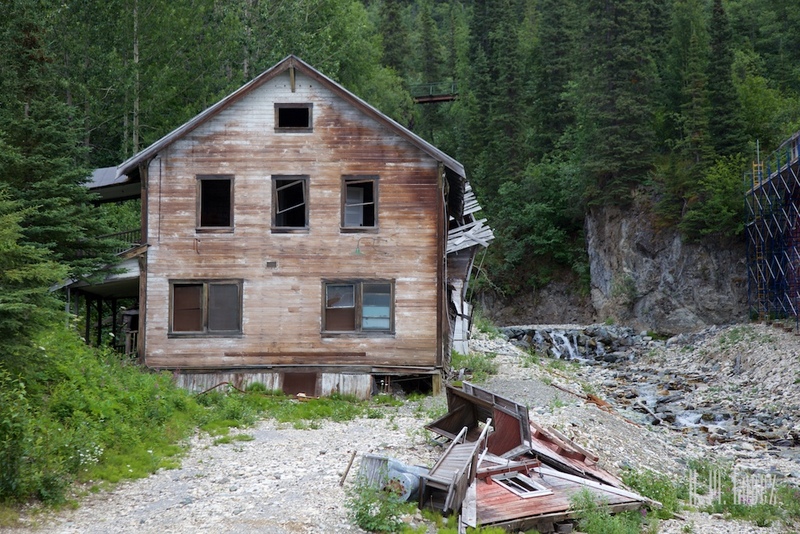 This was during the early 1900s, and the challenges of building a mine in this extremely remote area were great. 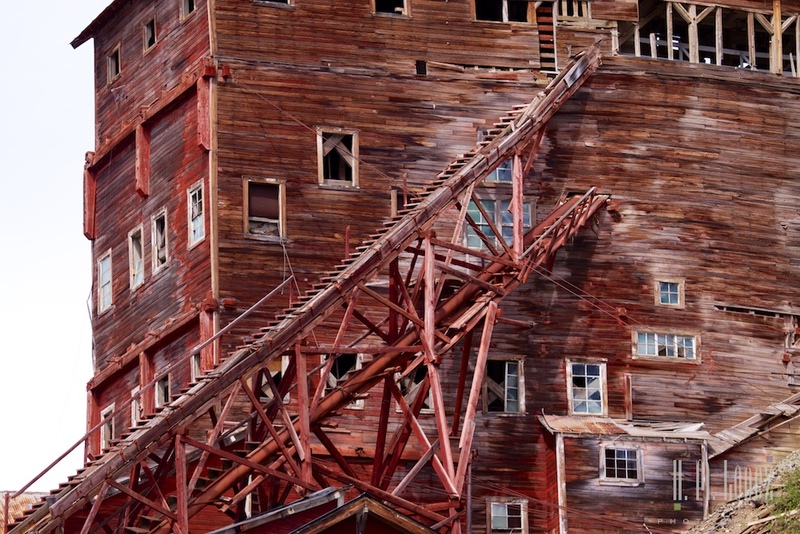 So the explorers partnered with the Havermeyer, Guggenheim and J.P. Morgan families for financial backing and Stephen Birch, a mining engineer. 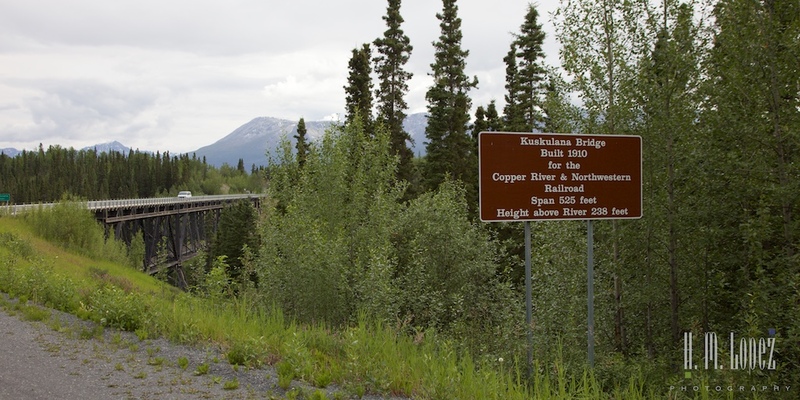 The group became the Alaska Syndicate and hired Michael J. Heney, builder of the White Pass & Yukon Railroad to build rail bed and bridges to transport the copper from the mine. 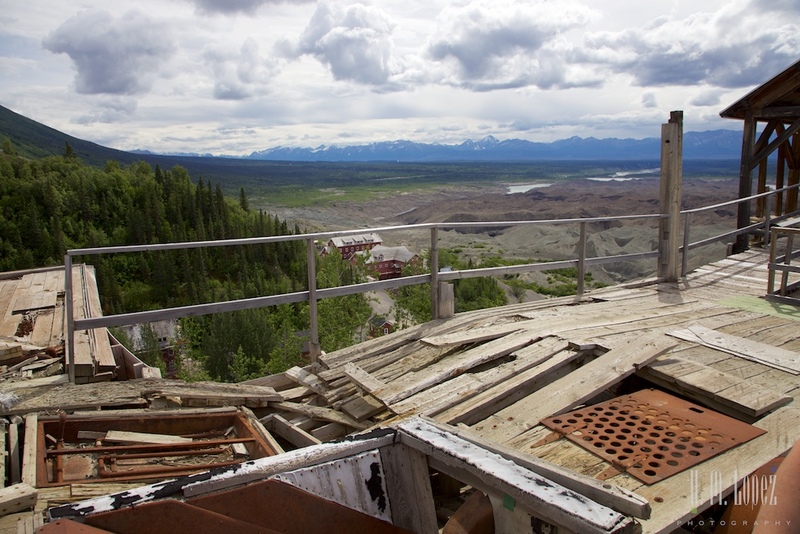 Mr. Heney brought a steamship in pieces from Valdez over the mountains to the Copper River where it was reassembled. 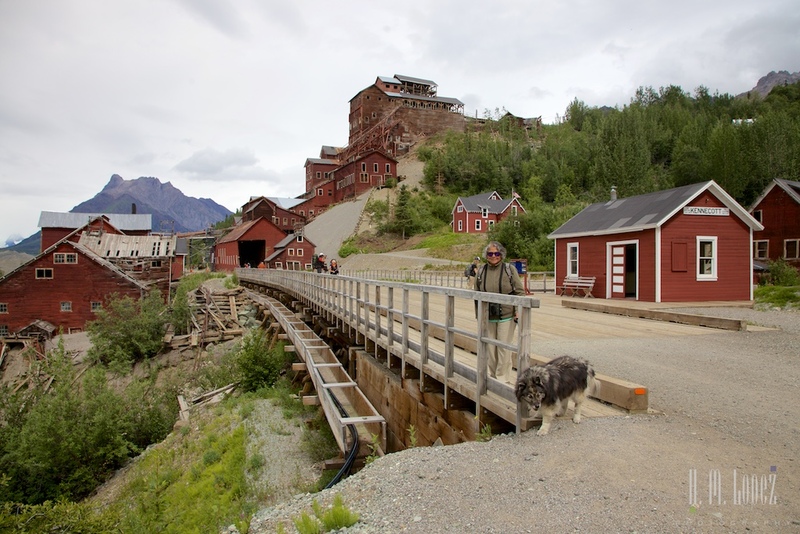 Equipment for the mine was brought in by dog sled, horse and steamship and so they were able to begin the operation prior to the railroad’s completion. 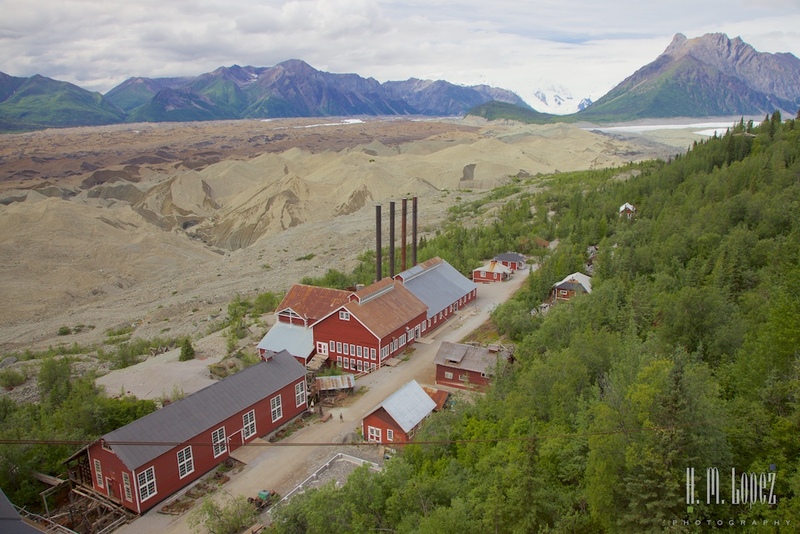 The Alaska Syndicate, which later became the Kennecott Copper Corporation mined some of the world’s highest grade ore from this mine and supplied copper for electricity, utilities, industrial development and munitions to be used in World War I. 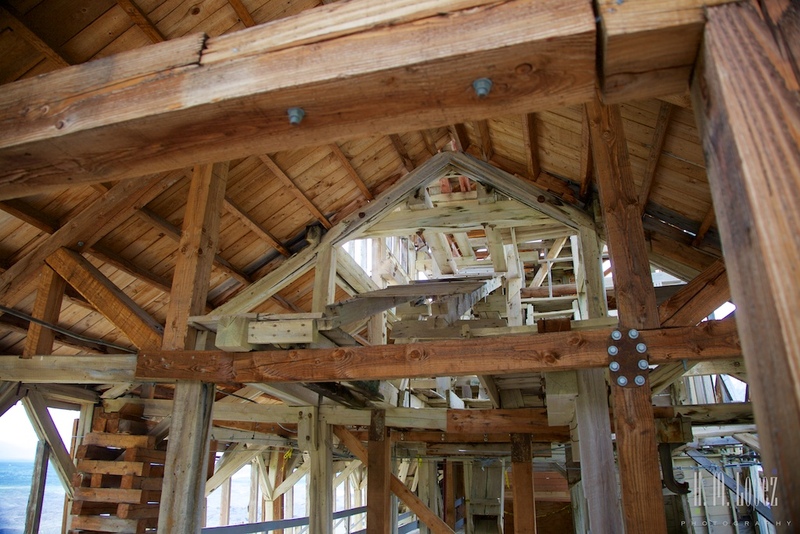 In 1998, the National Park Service system designated the town a National Historic Landmark. 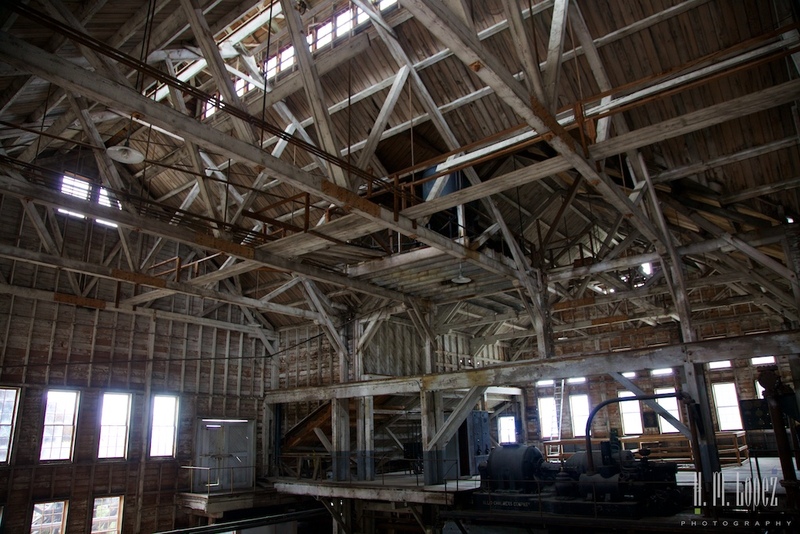 Some of the buildings are open and there are tours of part of the concentration mill. Hector joined the full tour and since dogs are not allowed in the mill, I joined for the half of the tour that takes place outside (half-price). 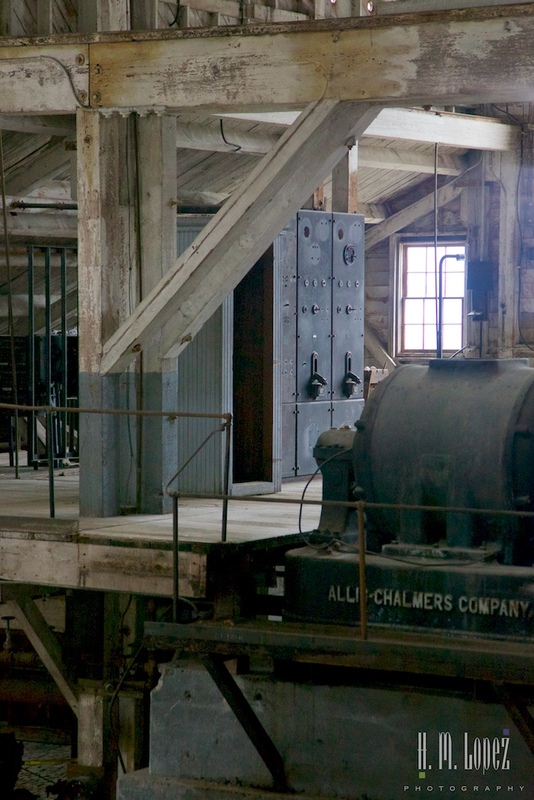 As the town developed and workers were hired, there was a clear distinction between the workers and upper management. 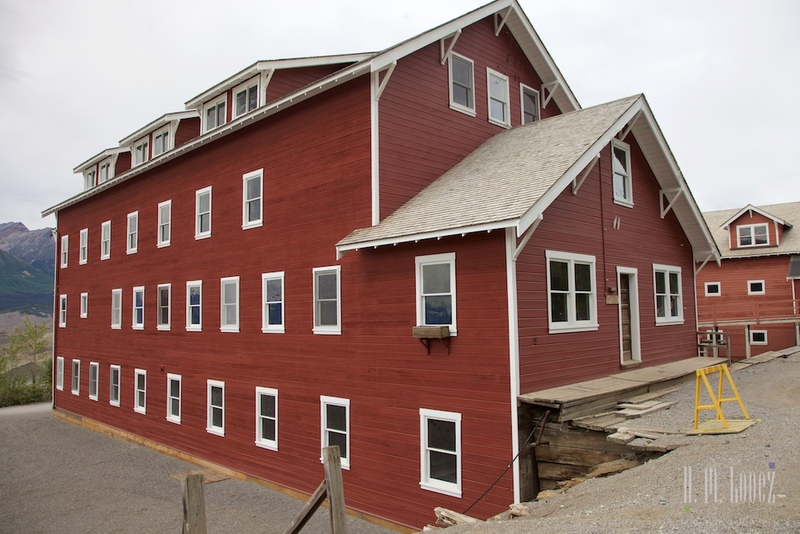 Workers were not allowed to bring spouses to the town, and lived in the bunkhouses. Upper management brought their families and lived in cottages, with ones higher up the hillside reserved for the people with the highest positions. 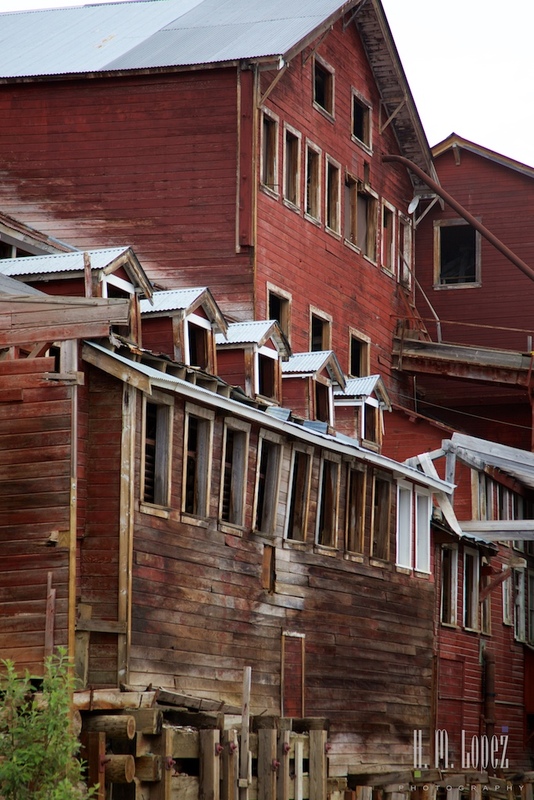 Nonetheless, the remoteness of the town made for a strong sense of community. 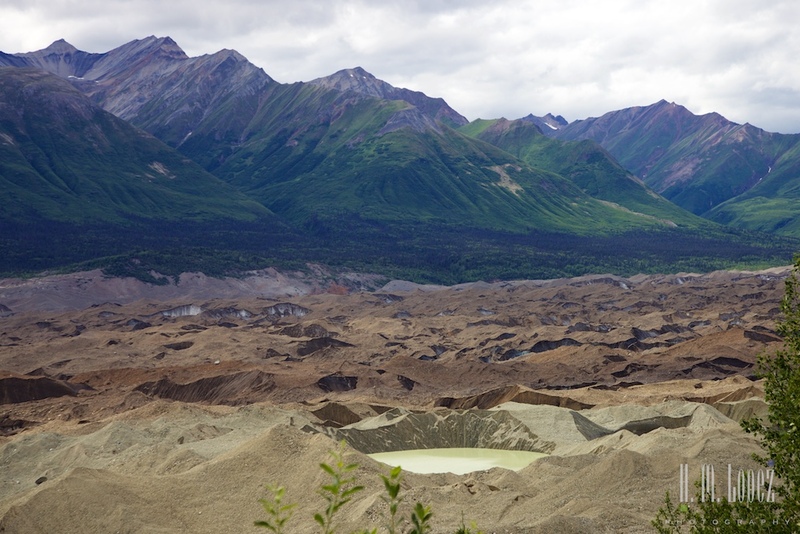 The Kennicott Glacier was and still is right by the town although it has receded quite a bit. At first glance it looks like a lot of mine tailings or gravel, but it is really between an inch and foot of sediment sitting on top of 100 to 1,000 feet of ice. You can just see some ice showing through here and there. 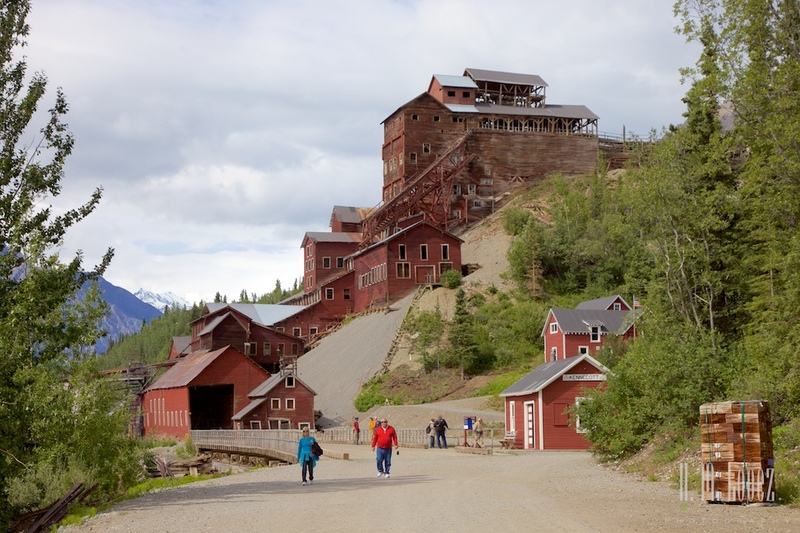 The town of McCarthy grew as the need for entertainment for the single men worked at Kennecott Mines. It was a tough environment, with temperatures in winter going to 40 degrees below zero. 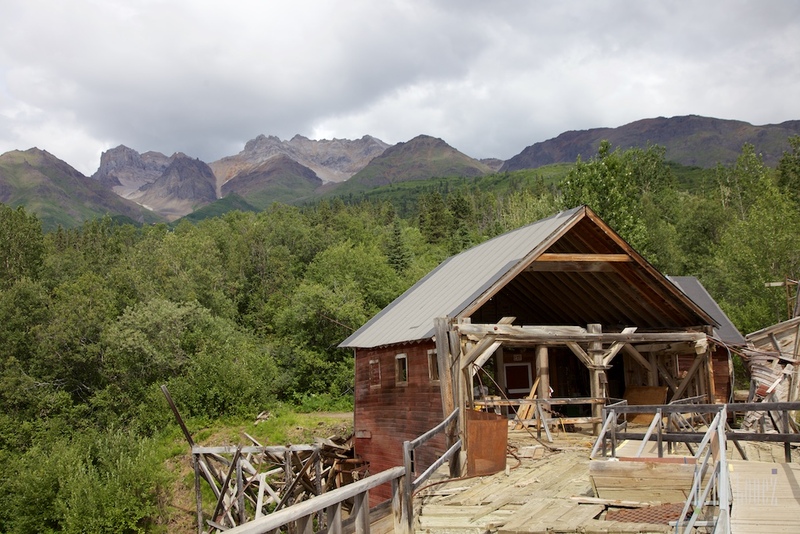 It got so cold that miners slept in the mines in winter, because they were warmer than the bunkhouses. And bars and brothels in McCarthy provided some escape from the harsh environment. 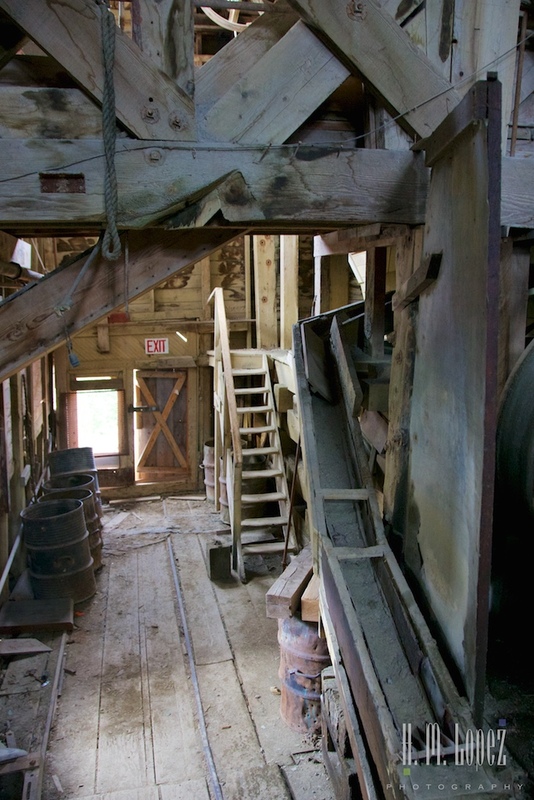 Initially frowned upon by upper management, visits to McCarthy were later seen as helping to retain miners, since the miners would spend all of their money and therefore need to keep working. A rare Rock Glacier. Only 15% ice but it moves like a glacier. 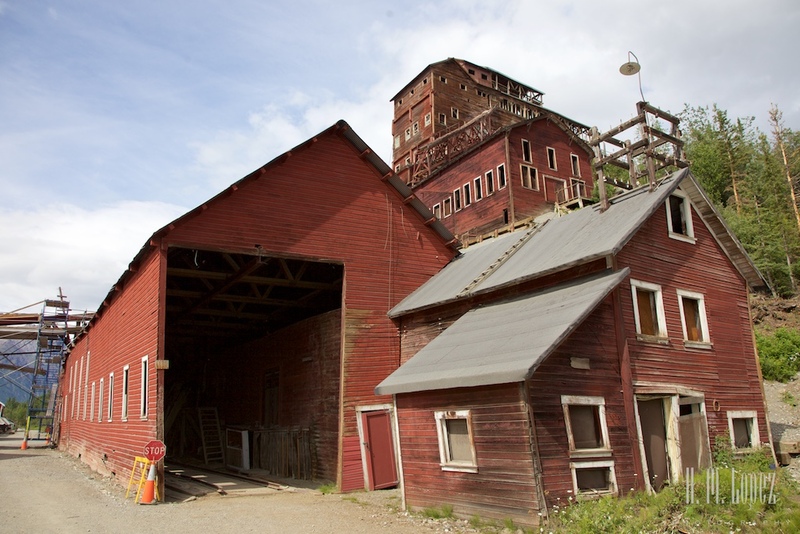 At its peak, the corporation employed about 600 people, and the mining camp grew to 100 buildings, including a dairy barn, a refrigeration plant, bunkhouses, a hospital a machine shop, a powerhouse, residences and others. 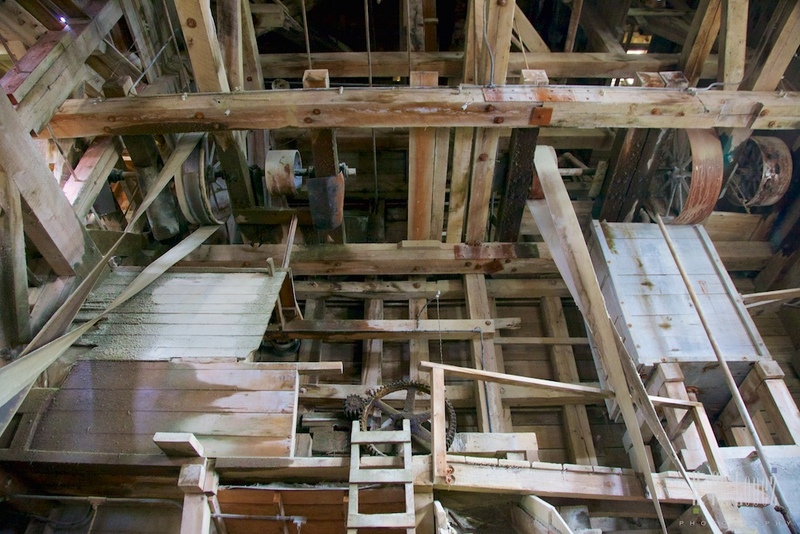 The tour inside the mill was incredible. 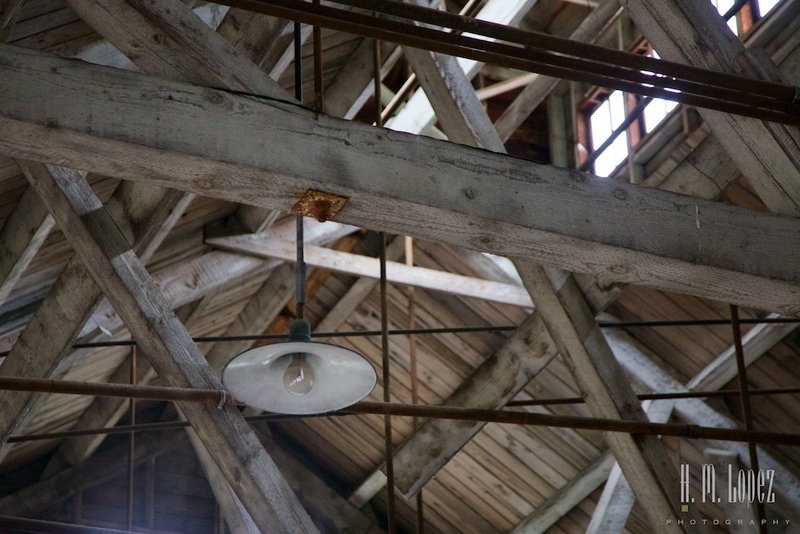 This 14 story building remains the largest post and beam wood building in North America and is cavernous inside. 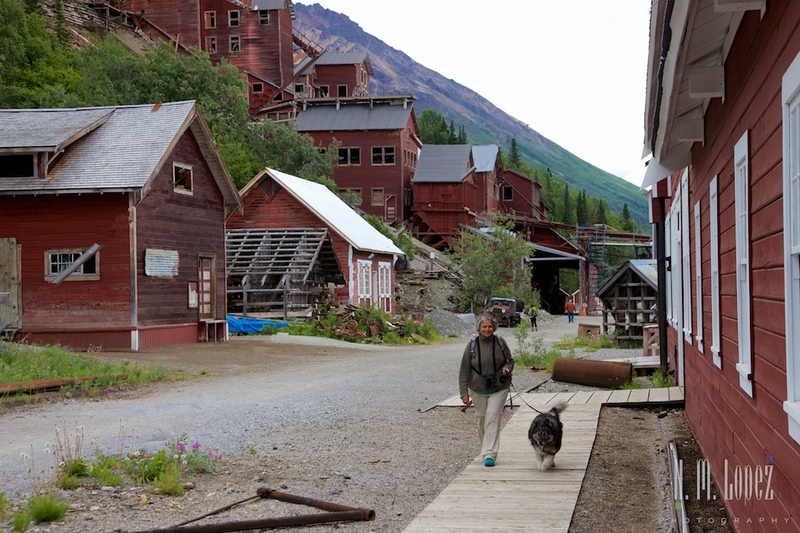 The guided tour begins by hiking to the top where you get a dizzying view of the buildings and glacier below and the mountains above, where the actual mines were. 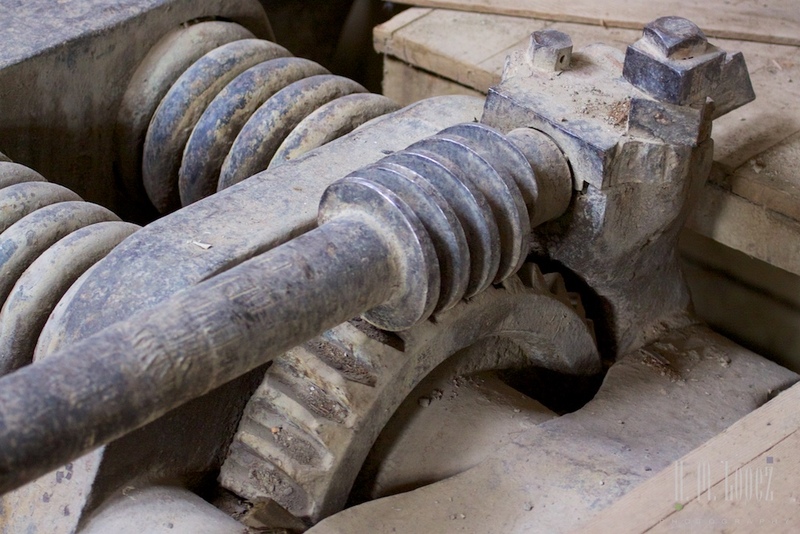 The rock was brought down by cable car to the top of the building where it then was dropped into an assortment of giant crushing, grinding and shaking contraptions intended to smash the rocks into progressively smaller pieces and separate the copper from the limestone. The tour takes you down through the building where you see the progressive stages. 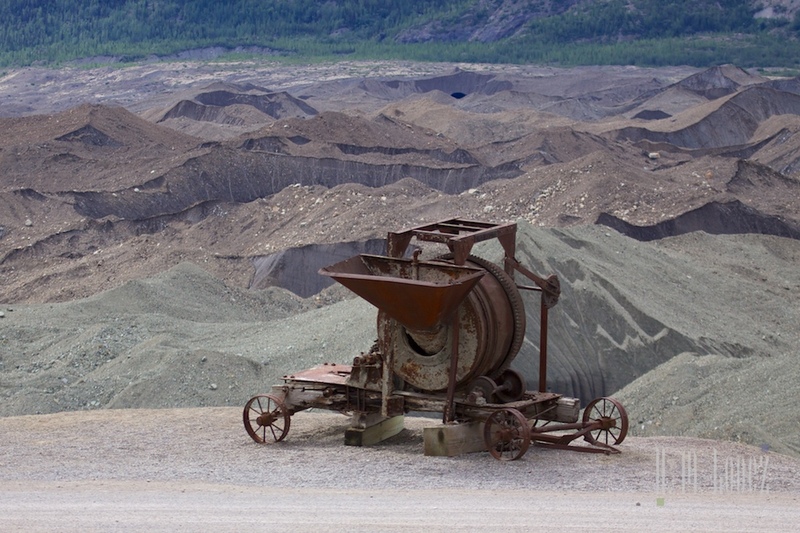 One can only imagine the roar of all this machinery going all at once. Very interesting. 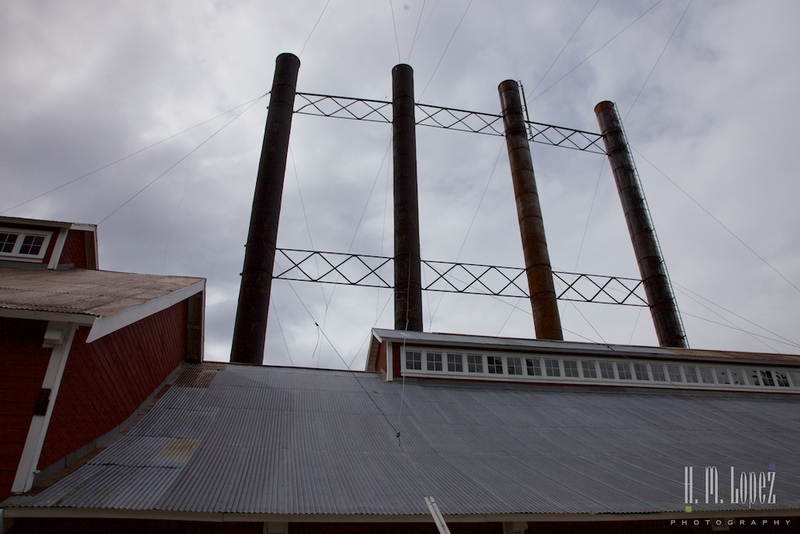 Another interesting building was the giant power plant. 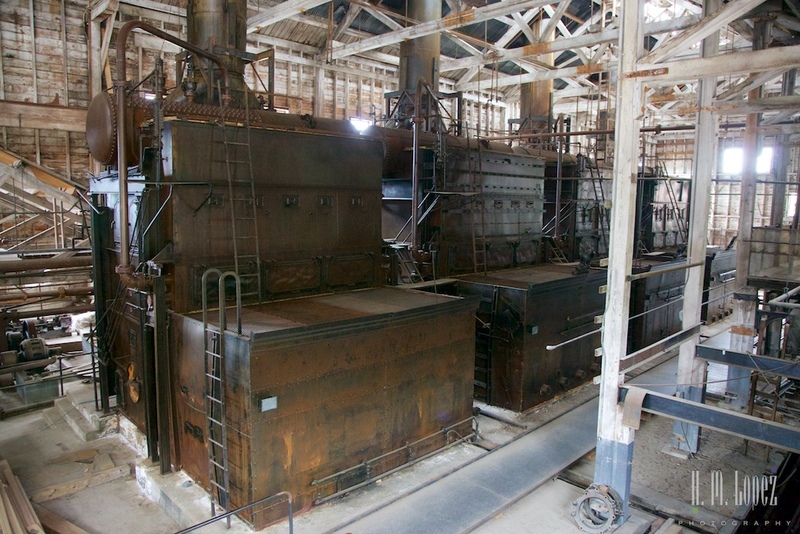 With enormous boilers and generators you really get a sense of the scale of power needed to run this place. 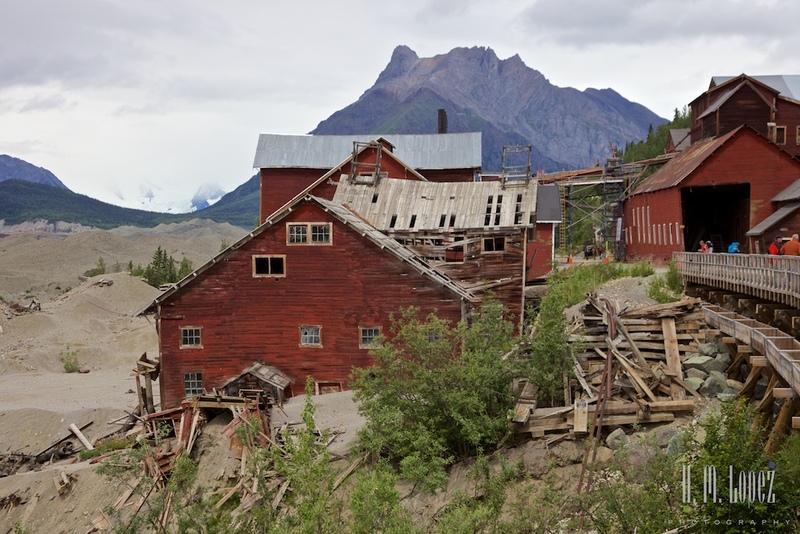 By 1938, a limited supply or ore and falling prices caused the mine to close, after producing $200-$300 million worth of copper and silver. 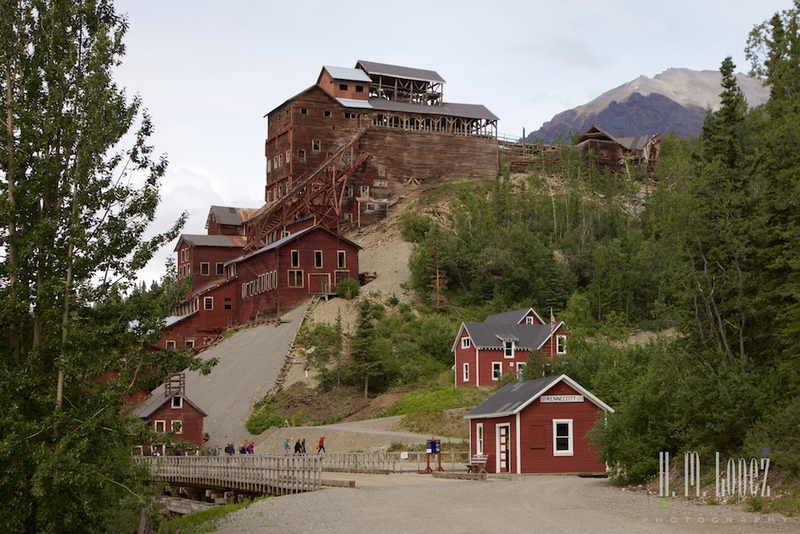 Various ventures in the town of Kennecott included private mining, resort development, tourism and homesteading. 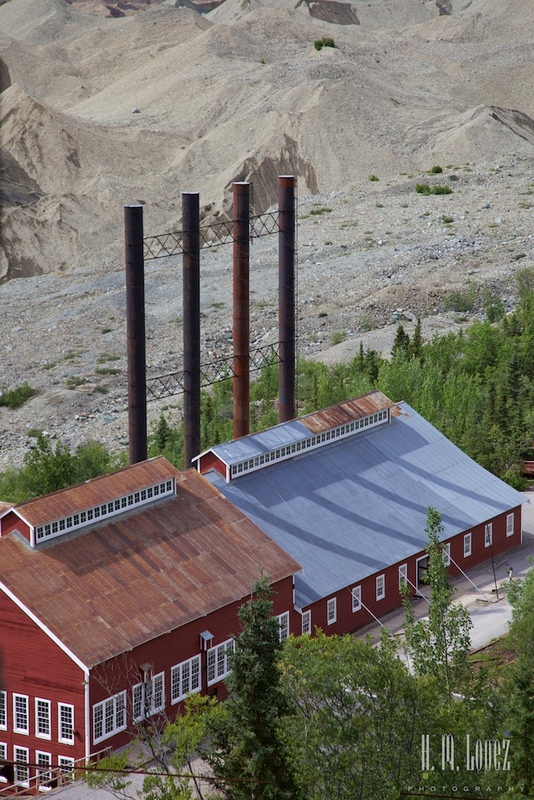 The Kennecott Copper Corporation, however, still operates mines throughout the globe. 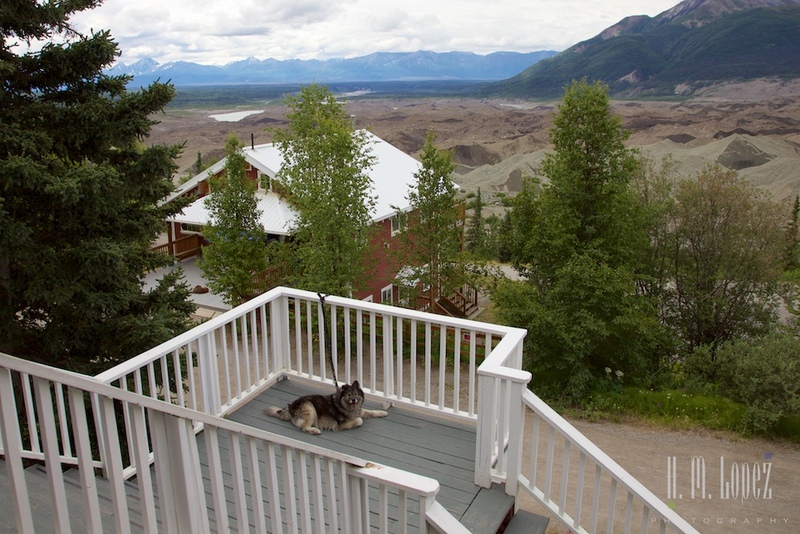 We only had time for a walk around the buildings, a delicious lunch at the Kennicott Glacier Lodge overlooking the glacier (although those party poopers did not allow Angel on their deck, she had to stay at a landing just below us), and the tour. 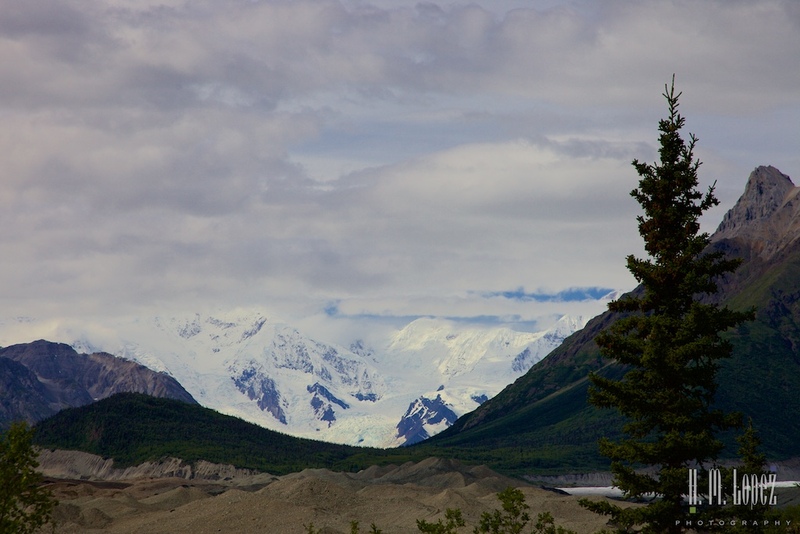 For those that have more time, hiking to the foot of another glacier, the Root Glacier (four miles roundtrip from town), exploring the cemetery on the way to the glacier, and walking the historic wagon road to McCarthy, as well as backcountry hiking are other options. 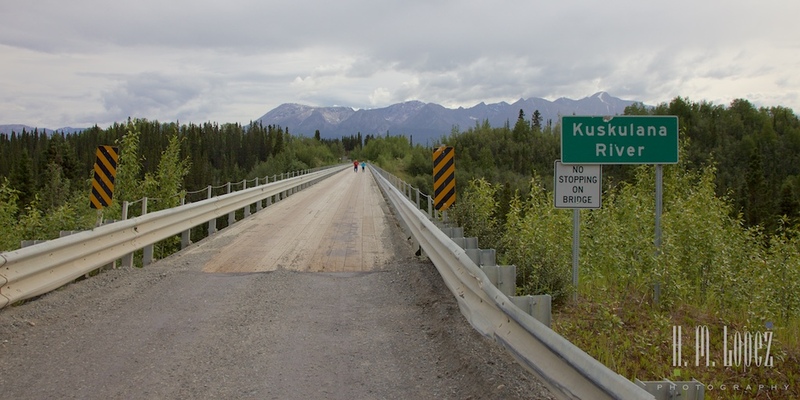 Our van ride back down to our campground was uneventful, except that the driver let us out to walk across one of the major bridges on the road which crosses the Kuskulana River. 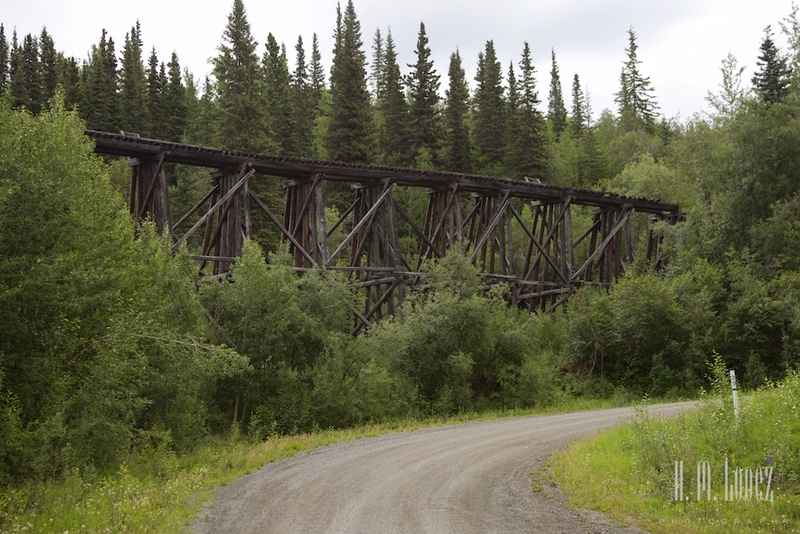 It was built as a railroad trestle in 1910. 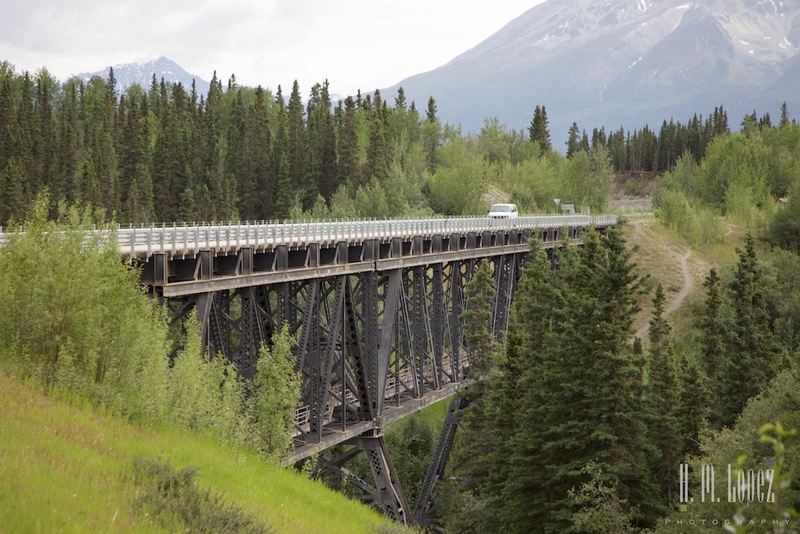 When converted to a road bridge it originally was only planks with no guardrails and over 240′ to the river below. It must have been terrifying to cross. Now it is narrow, but quite safe feeling. 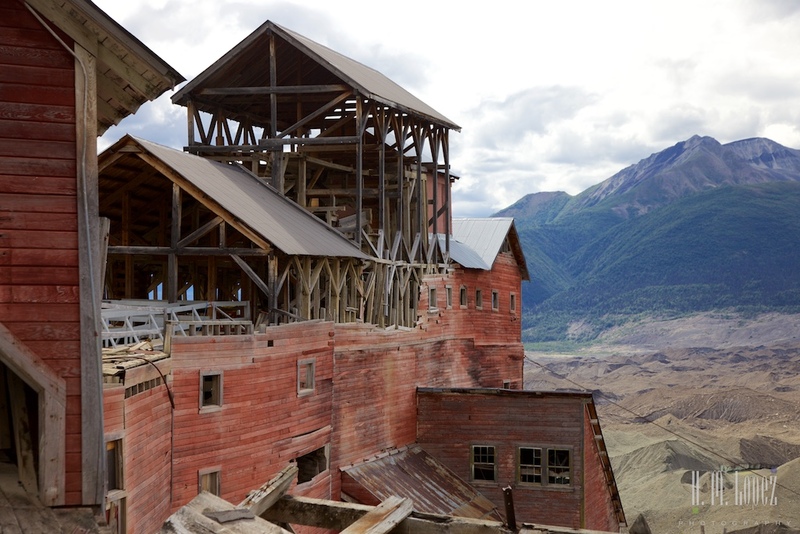 Kennecott is definitely worth visiting. In my opinion, the van “tour” which provided no information is overpriced. But it does take a total of five hours of driving roundtrip, so may be worth it for some. We would have preferred to drive at our own pace and schedule but we were happy to have the van option given the circumstances. 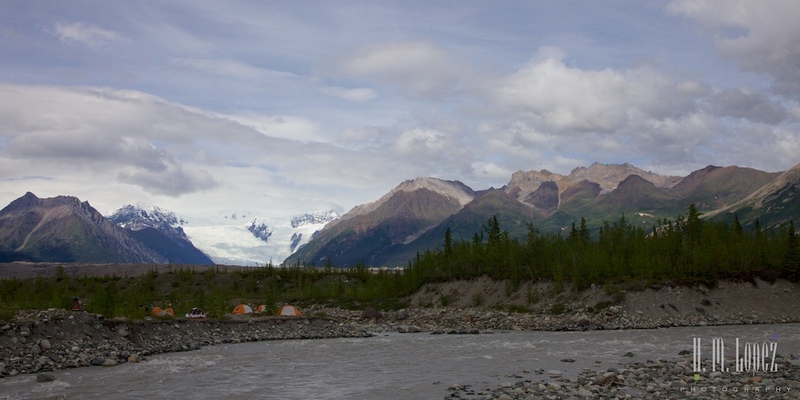 This entry was posted in Alaska, RV fulltimers, States Visited and tagged boondocking, dry camping, forests, glaciers, museums, national parks, Roads by islandgirlwalkabout. Bookmark the permalink. What a fantastic site to visit and imagine what it must have been like when in full operation!!!!! !Brenda/Hector, your pictures and associated stories make me want to go out and buy a LAND CRUISER and forsake the sea as a travel medium. Keep up the fantastic journey for us to share it with and gain a fantastic range of knowledge about this wonderful world. Thank you so much! It’s funny because every now and then we talk about getting a boat and traveling around in it. But the land yacht has been great! Thanks for staying with us on our journey. What a great little trip! I love the old stuff and have never seen anything like this mine. Very different from the ones in Colorado! 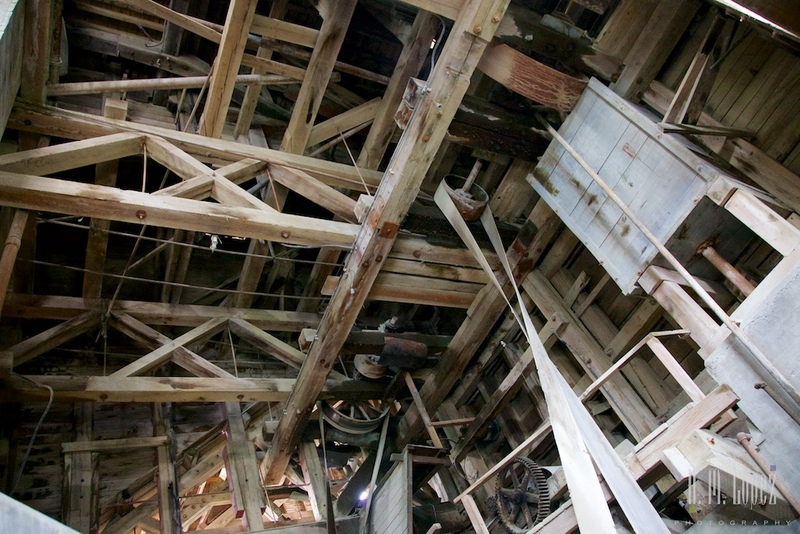 I can’t believe a 14 story wood beam building is STILL standing! Amazing. thanks! 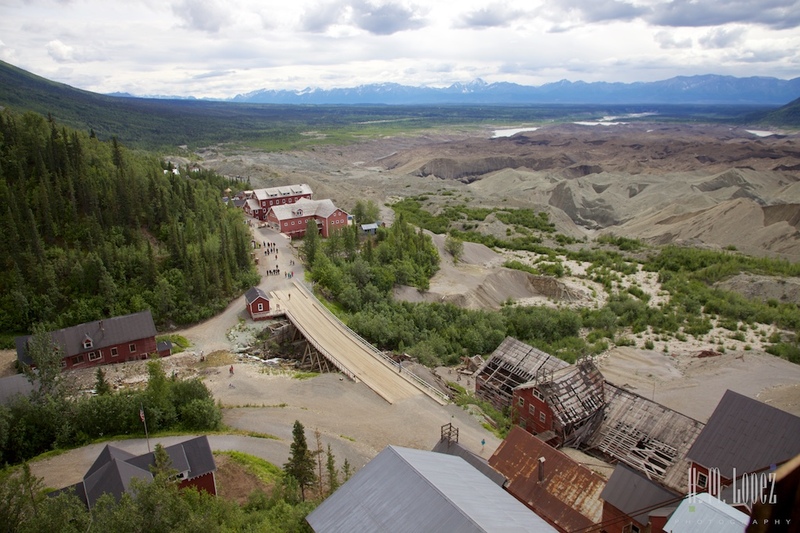 Yep, the mine and the town were pretty amazing! There is a reality TV show that launched last October that is filmed in McCarthy. It is called “Edge of Alaska”. Too bad you missed a visit to the town. There are some entrepreneurs trying to make a go of it, and others who want it to remain as is, setting up the conflict for the cameras and audience. 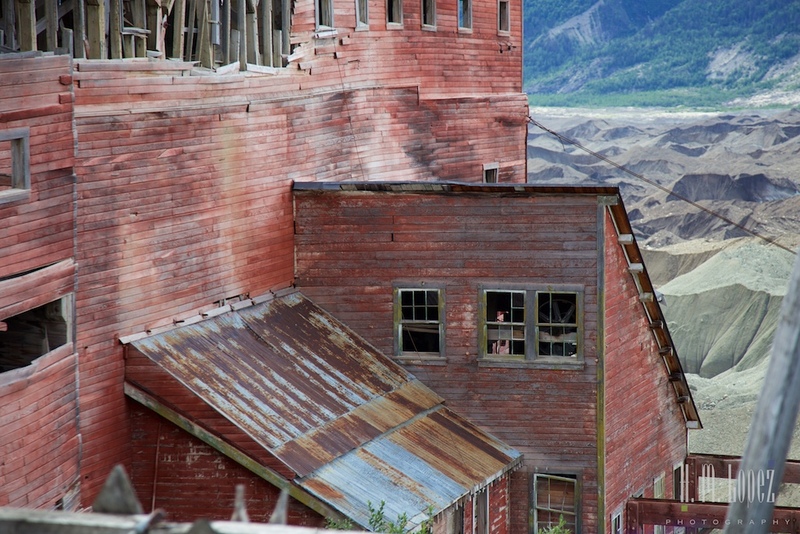 Some of the filming and sets have featured the Kennecott mill and mine. I know, the van “tour” just doesn’t stay long enough to see both. 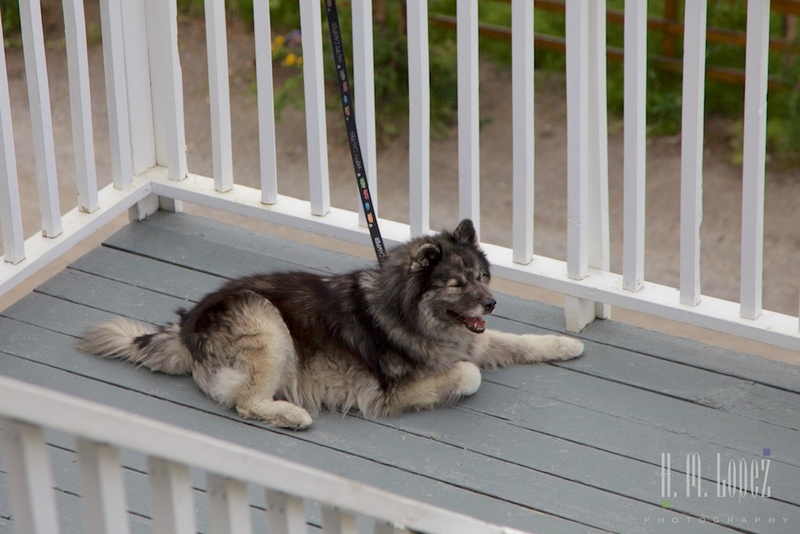 We will try to check out this Edge of Alaska program, thanks for the tip! 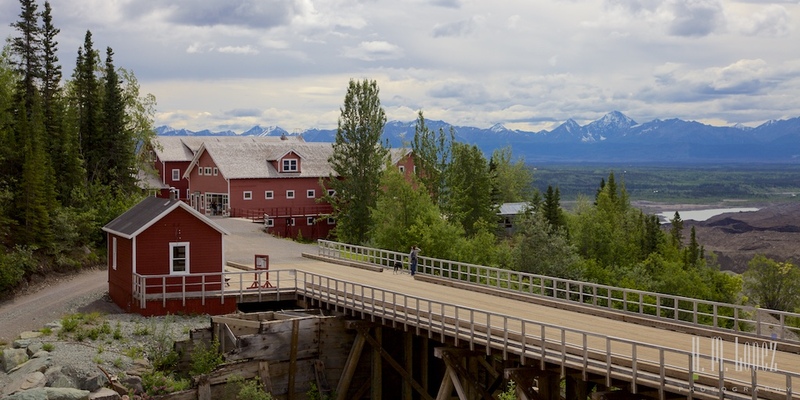 I did not know about this town in Alaska…very interesting. 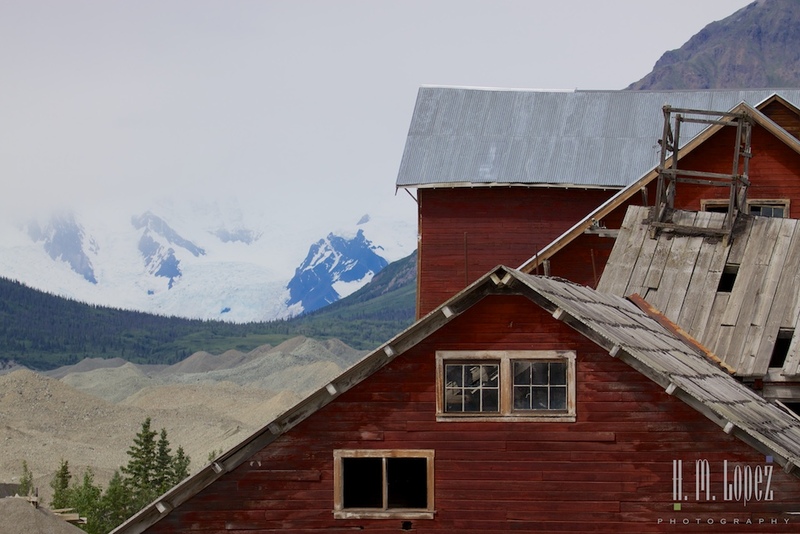 Love the photos of the old mining buildings and the Rock Glacier. I had no idea that a glacier with so little ice still moves as it does. The rock glacier was pretty surprising, and the town is very interesting, crazy to think how they built it! Interesting tour and photos. And Angel is a sweetheart. Thank you and yes she most certainly is! Having seen the actual road would you have rather driven Coqui? 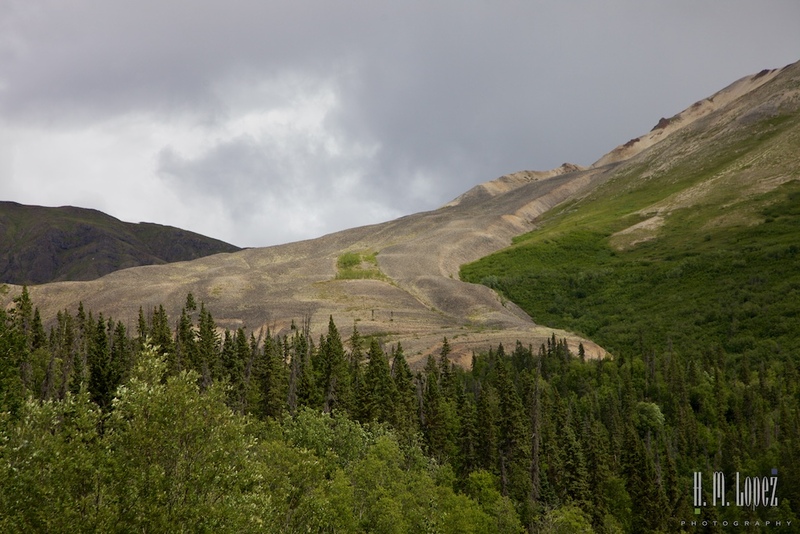 It is really amazing how those men build the mine in the middle of nowhere up in Alaska. 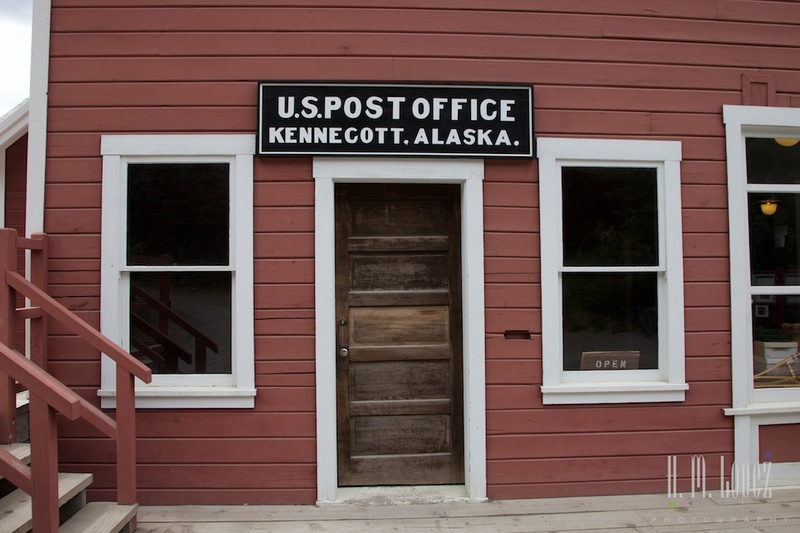 Too bad you did not have enough time to visit McCarthy, it is a cute little quaint town with some interesting stuff to explore and photograph. Hector says yes, we would have driven up there ourselves. 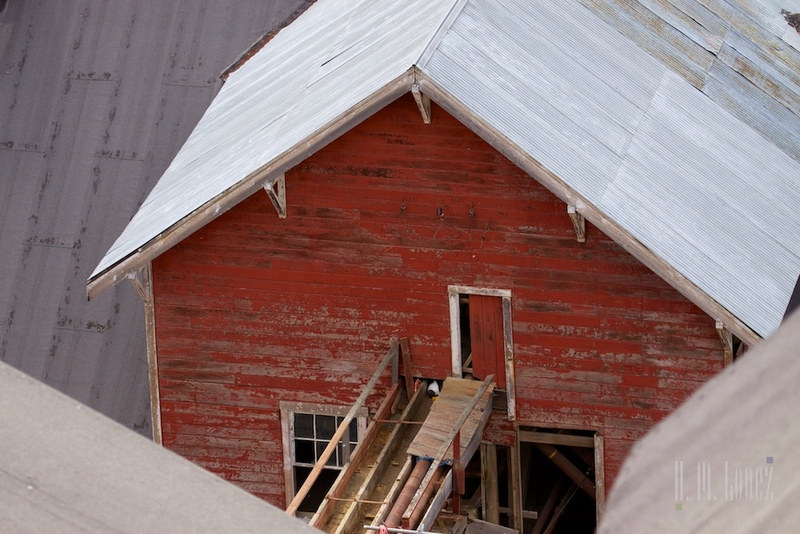 The van tour just did not allow enough time, but at least we got to see Kennecott. 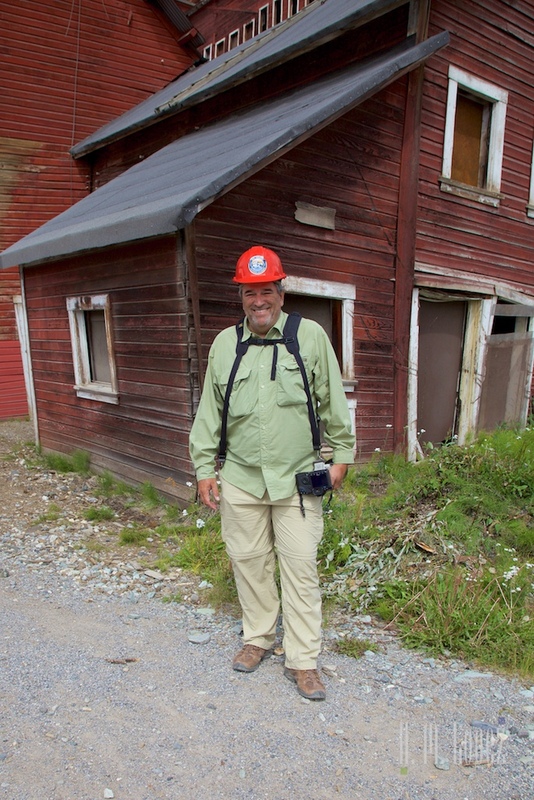 Your images and description made up for me not being able to tour the mine – lovely and detailed! I did tour McCarthy and don’t think you missed much of anything. Oh, thanks, it’s always hard to find the balance of what to see and what not to see. What a great place to visit! Looks so interesting. Glad to see that they are keeping it open to visit. Thanks for sharing you wonderful trip. Yes, and they are maintaining the buildings so they will not deteriorate further. You’re welcome!